Whilst internal cut-outs, rebates, panel moulds or the templates for all three can be easily be set up using battens and double-sided tape, there is nothing like having a dedicated system to simplify the process. Although it still requires squaring and clamping, the Varijig Frame System works extremely well, due in no small part to the use of a guidebush as the frame following device. This system of course means that rebates and multi-profile panel moulds are possible, providing you have a range of guidebushes available. The high quality anodised aluminium extrusion and the simple plastic stabilising foot provides a super-smooth running base which certainly reduces the risk of mishaps. I had some success with making some one-piece MDF picture frames although I only used the Frame System for the internal rebate and cut-out. The external cuts were still made with a saw and then routed flush with a planted-on template. However, the process was made much easier and quicker by the use of the Frame System. 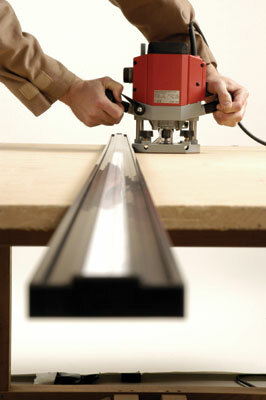 A super-long straightedge made from the same extrusion as the Frame System. Can either be used as single length guides or an easy to make, two-part assembly which goes together very straight indeed, although despite its rigidity, too much sideways pressure on the full length guide will take a router or saw off course slightly. I would be tempted to drill a small hole near the halfway point of the extrusion in order to add a bracing pin - workpiece permitting. The clamps are very pleasing brass and aluminium assemblies that slide into the underside of the extrusion. 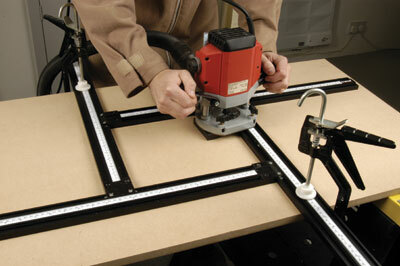 The Varijig Frame System is a great helping hand for making cut-outs and cut-out templates. In a professional workshop this jig would undoubtedly pay for itself with the time it saved, whereas for home users it represents a good step further towards hassle free routing but is certainly no routing grail. The recommended 30mm guidebush with an extra long 10mm spigot will cost you another Â£6.00 plus VAT and will certainly reduce the risk of mishaps, but I managed well enough with a standard spigot size. Onto the Varijig Straight Guide. It is well engineered, long and undoubtedly useful, although ultimately an eight foot length of 18mm MDF and some quick clamps will do virtually the same job for nothing more than a few quid. I will happily use the Guide on loan but I'm not sure if I'd buy it. "The process was made much easier and quicker by the use of the Frame System"